Dr. Isiaah Crawford is the 14th, and current, president of University of Puget Sound, a prestigious liberal arts college in Tacoma, Washington. He was selected on February 26, 2016, and assumed the presidency on July 1 of that year, succeeding President Ronald R. Thomas, who retired after 13 years as President. 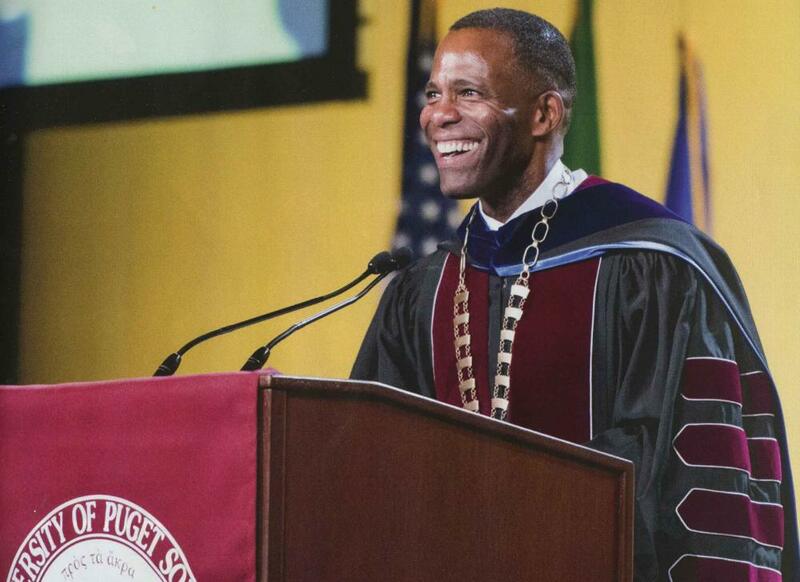 Crawford is the first African American president of the University of Puget Sound, as well as the first black LGBTQ president of any prestigious university in the United States. Crawford, was chosen out of nearly a hundred applicants, and ten semi-finalists, as part of a national search conducted by a 14-member committee made up of representatives from the board of trustees, faculty, students, alumni, and staff. Crawford’s academic work and achievements made him a natural successor to President Thomas. His appointment was met with great excitement, both by students and Tacoma residents. Born in Bethesda, Maryland in 1960 and raised in St. Louis, Missouri by his mother, grandmother, and aunt, Crawford’s family was one of only a few African American families living in the Central West End, a predominantly white, Catholic neighborhood. He was an excellent student, and the first person in his family to attend college. He received his bachelor’s degree from St. Louis University, and his master’s and doctoral degrees in Clinical Psychology from DePaul University. He spent much of the 1980’s focusing on HIV/AIDS, particularly on prevention. Crawford had always thought he would become a full-time therapist, working in a psychiatric hospital or a mental health clinic but when, in 1987, one of his professors urged him to apply for an open assistant professorship in the psychology department at Loyola University Chicago in Illinois, he did so intending to leave after he passed his licensing exam. He instead became a licensed, practicing psychologist, maintaining a private practice from 1987 until 2002, but he also continued teaching. Crawford was promoted to professor in 1999, teaching courses on psychology of personality, human sexuality, human diversity, and minority mental health. Crawford first entered college administration when he volunteered to assist Patricia Rupert, Loyola’s Clinical Psychology Training Program Director, deal with her massive workload. Loyola appointed him her successor and from there he became Department of Psychology chair (1997-2003) and interim Dean of the College of Arts and Sciences (2003-2004). In 2008, Seattle University recruited him to be the school’s new provost, where he directed the Division of Academic Affairs, overseeing the university’s various schools and colleges, libraries, enrollment, institutional research, faculty, and academic achievement support, among other duties. In addition to his work in academia, Crawford also served (or currently serves) on several boards of directors including the Seattle Symphony and the AIDS Foundation of Chicago (1994-2008). He has been frequently published in scholarly journals over the last three decades, and served on the editorial boards of several others. In June of 2016, he married his partner of 15 years, Dr. Kent Korneisel, an optometrist. Chuck Luce, “Get About It,” Arches, Autumn 2016, https://www.pugetsound.edu/about/offices-services/office-of-communications/arches/archive/autumn-2016-arches-get-about-it/; “President Isiaah Crawford,” https://www.pugetsound.edu/about/office-of-the-president/biography/: Gene J. Koprowski, “First African-American, Gay President of Puget Sound University, Isiaah Crawford,” https://ebanman.com/blog/2018/04/02/first-african-american-gay-president/: “Isiaah Crawford Named Puget Sound's 14th President,” Feb. 26, 2016, https://www.pugetsound.edu/about/office-of-the-president/biography/meet-president-crawford/. Chuck Luce, “Get About It,” Arches, Autumn 2016, https://www.pugetsound.edu/about/offices-services/office-of-communications/arches/archive/autumn-2016-arches-get-about-it/; “President Isiaah Crawford,” https://www.pugetsound.edu/about/office-of-the-president/biography/: Gene J. Koprowski, “First African-American, Gay President of Puget Sound University, Isiaah Crawford,” https://ebanman.com/blog/2018/04/02/first-african-american-gay-president/: “Isiaah Crawford Named Puget Sound’s 14th President,” Feb. 26, 2016, https://www.pugetsound.edu/about/office-of-the-president/biography/meet-president-crawford/.